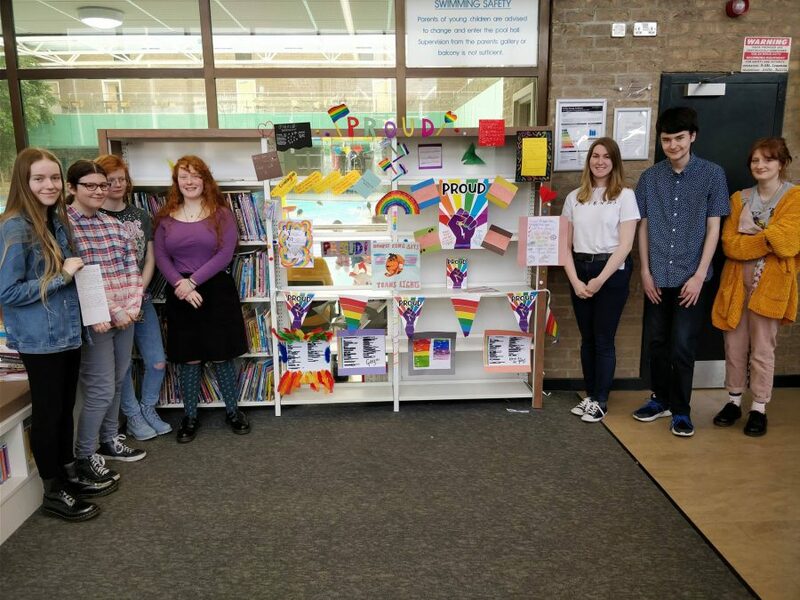 Our Cramlington Young Writers’ have been working on a Reading Hack project to creatively respond to Proud, a forthcoming anthology of LGBTQ+ voices. Armed with glitter, felt-tips, and their own personal experiences, they worked together to make a display in the library. In this blog, young writer Amy tells us what she enjoyed about the project. A few weeks ago I was delighted to receive a book; a very free, very colourful book. After devouring it in only a day I was happy to learn that this book is incredibly gay. The group was equally enthusiastic. We were reading stories that truly reflected us. We were tasked with responding to the anthology; Proud, compiled by Juno Dawson. So we bought glitter and equipped ourselves with bright markers. The anthology holds a diverse set of characters, all of whom you can’t help but fall in love with despite the little time spent with them. We wanted to do the characters justice and make the gayest, most vibrant display we could imagine. This project has been my favourite since starting the group. It has been fun, and colourful and very important to me. Let us cast our eyes back to a simpler time: it’s 2008, people owned Blackberries, Blockbuster was still open and I was seven, sat in my room watching my sister’s Buffy the Vampire Slayer VHS tapes. I become obsessed with Willow. She’s ginger, she’s a witch and she dates boys and girls! I fell in love with Tara, her girlfriend. All was well, and it was my first time seeing a lesbian relationship. However, it became unhealthy and (spoiler alert) it was also my first run in with the ‘killing off the gays’ trope. A trend which would haunt my gay fantasies of growing up, marrying a woman and owning a goat farm with my wife. The stories in Proud show a different reality. The reality of the gays, where we love and play DnD and deal with grief and make friends just like everyone else. But most importantly, they show us happy. We can be happy, and healthy! We can find love, usually after the awkward ‘Are they gay or just friendly?’ moment. We can pick our friends and worry about coming out. Or we can not bother with coming out at all. Proud made me cry. It made me grin. And overall, I’m extremely proud to have worked on a display for a book I know will help so many teens (gay, trans, enbies!) finally see themselves. To see more photos of the group’s work, visit our Facebook page. If you are interested in joining one of our Young Writers’ Groups, find out more here.